Without using any third-party software applications, Windows has built-in ability to lock or hide a disk drive from easy viewing from Windows Explorer or File Explorer. Hiding a drive is useful to prevent easy access to the content and data especially if they are sensitive or confidential in nature. The easiest way to hide a drive, whether it’s an entire disk, partition or volume, is by removing its drive letter. Without a drive letter, the drive won’t show up in Windows Explorer or File Explorer, and is not visible to people to have access to the PC. Open Win X Quick Access menu and select Disk Management. Select the volume/partition that you want to hide. 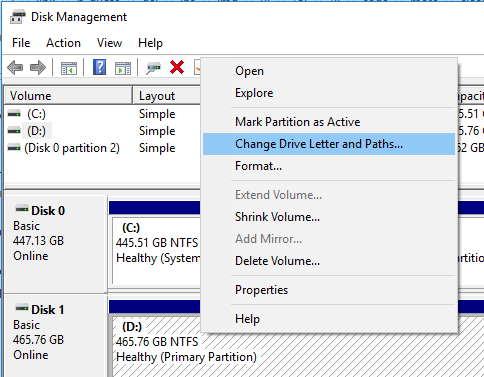 Right-click the volume/partition and select Change Drive Letter and Paths from the contextual right click menu. Alternatively, select Change Drive Letter and Paths from Action -> All Tasks menu. Select the Remove button to disassociate the drive letter from the volume/partiton. 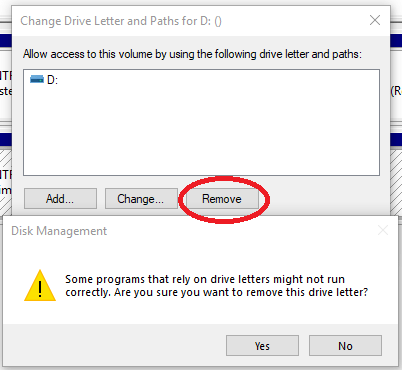 Select Yes on the confirmation dialog to remove the drive letter. confirming you’d like to hide the disk or partition. If the drive is currently in use, it will still be available for use until computer restarts even though the drive letter is freed. To make the drive visible and accessible again, just re-add the drive letter to it in Disk Management. Open an Administrator’s Command Prompt. Type DiskPart and hit Enter. Type List Volume and hit Enter to show a list of all volumes and partitions. Type Select Volume X where X is the numerical number of the volume represents the drive that you want to hide, e.g “Select Volume 1”, and hit Enter. Type Remove Letter=X where X is the drive letter for the drive that you want to hide and selected in previous step, and hit Enter. When DiskPart successfully removed the drive letter or mount point, the drive is hidden from view. Run Local Group Policy Editor (gpedit.msc). Double-click on Hide these specified drives in My Computer and select Enabled. Then, select the drive that you want to hide form the drop-down menu. When enabled, the icons of specified drives are removed from My Computer and File Explorer, and the drive letters representing the selected drives do not appear in the standard Open dialog box. 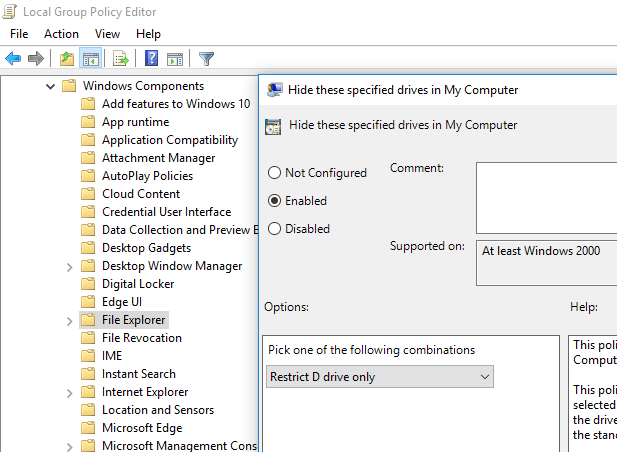 This policy setting removes the drive icons. Users can still gain access to drive contents by using other methods, such as by typing the path to a directory on the drive in the Map Network Drive dialog box, in the Run dialog box, or in a command window. Click on OK and restart the computer for the change to take effect. If you don’t have Local Group Policy Editor, you can modify and edit the Windows Registry directly to hide the drive. Right click on the “Explorer” tree or the blank area on the right pane, and create a New -> DWORD (32-bit) Value. Name the new value as NoDrives. Double click on “NoDrives” to modify its value data. Enter the value data according to the unique number associated with drive letter that you want to hide as listed in table below. The table lists the value in decimal, so when entering the value data, choose the base as Decimal. If you want to hide multiple drives, enter the sum of the values for the drives as the decimal value data. To unhide and reveal the hidden drives, delete the “NoDrives” registry key or set its value data to “0”. For PowerShell lovers, it’s possible to use PowerShell commands to modify the registry and assign the value to “NoDrives” registry key. Replace the value X with decimal value representing the drive letter as listed in the table above for Registry Editor method. Restart the computer when done for the drive(s) to be hidden.